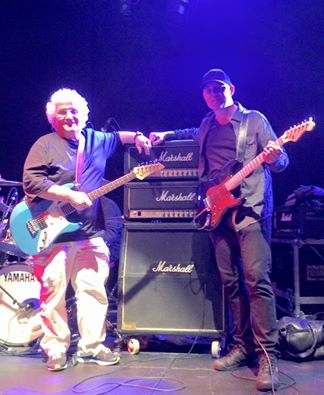 David Freiberg and Jude Gold of JEFFERSON STARSHIP admire the wall shaking magnificence of my amplifier! 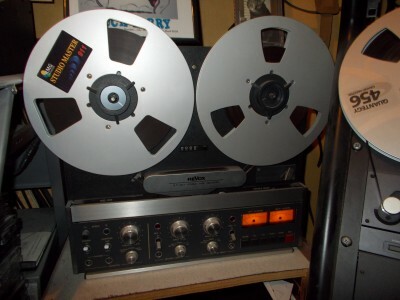 CDs come from this wonderful REVOX tape recorder! Would you like to see some of my guitars? I do have quite a few, but these are the current favourites. 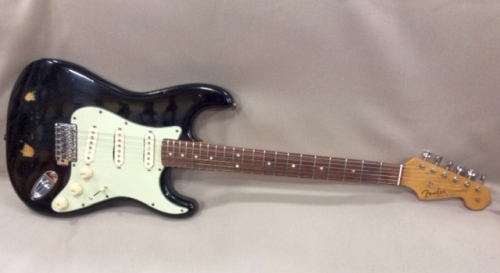 Behold the splendour of this 1963 Fender Stratocaster! 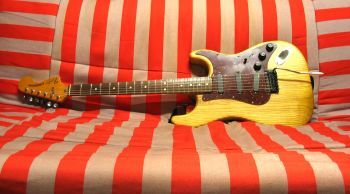 Recently unearthed in a house clearance and restored to an exemplary standard by Denver of Intersound Guitars, Dursley. This Hayman 10:10 was made in 1970 and was a 17th birthday present from my father. You'd best believe that I've played an awful lot of guitars in my time, but this is the only one that I can think of that's completely unplayable. 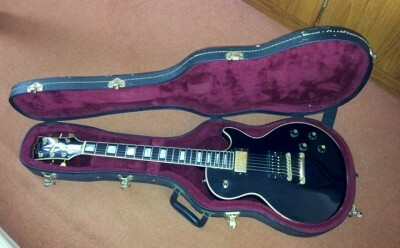 Lovely 1974 Gibson Les Paul Custom. Should you want to hear what this sounds like check out VERDEN ALLEN'S album "LOVE YOU AND LEAVE YOU" on Angel Air Records. But be sure to wear goggles and thick gloves. 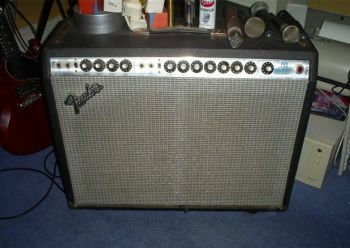 I bought this Sound City 4 x 12 for £60 in 1978. Here it is at a major London date with Mott the Hoople's Verden Allen. I think I've had my £60 worth, don't you? Once upon a time, I played this whatever the situation, sessions, vocal harmony bands, rock and roll groups, you name it. It's been badly smashed in a frank and open discussion about a Christmas turkey but Johnny Kinkade repaired it (probably better now than before). I bought it in 1983 from John Perry of The Only Ones, who in various interviews declared it once belonged to Pete Townshend. So there! After it had been pinched (and subsequently recovered) I decided to keep it for studio use. 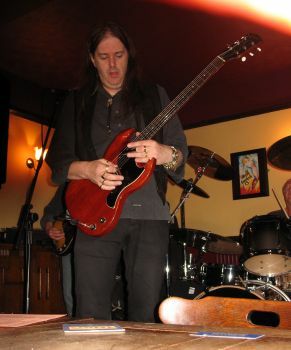 Now, for live appearances, I use a 1961 Gibson Les Paul/SG JR. In order to make it more of a duplicate of the old Gibson for live work, I reshaped the neck, upgraded all the hardware, gave it a refret and changed the pickup. 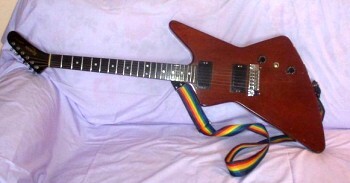 I found this by accident - I wasn't looking for a Flying V but I'm certainly glad I found it! I use it both for studio and live, turn-and-turn-about with the respective SGS. 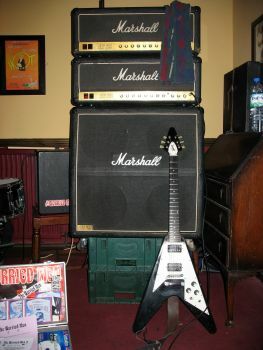 The manager of The Pink Fairies obtained me this amplifier and cabinet from the Marshall factory. I bought the second amplifier from Heron Music in Bristol. I use this outfit live and for recording "Dirty" sounds. I knew that a Stratocaster would be handy for recording. This old dogbox dates from 1979. It looks awful, weighs a ton, but (I've refretted it) it's fun to play. The EMG pickups ensure a good recording sound too. 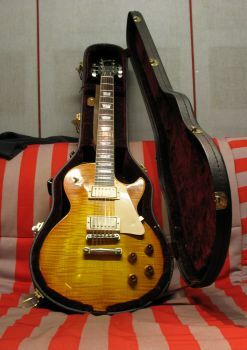 I've had a few Les Paul guitars, but this historic collection Sunburst is the best so far. Steve Treble got it from George Gruhn in Nashville. I use it as a spare for gigs. After trying over twenty models, this SJ200 was the one I liked the best. Dave at Heron Music got me this smashing J185 twelve string directly from Gibson. 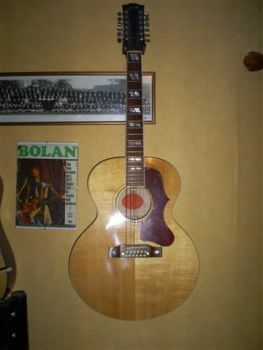 This is a very early Dan Armstrong see through guitar, made in 1969. This very guitar has been written about extensively in Guitar and The Guitar Magazine, so I'll simply say that it's very heavy to hod around all day. 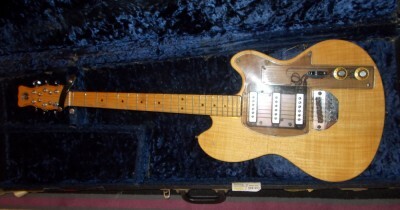 Boy, this 1959 Les Paul Jr is a pip! When I went to New York I intended to realise many of my adolescent fantasies, one of which was to buy a vintage Les Paul Jr from a pawn shop. I didn't get as far as the Pawn shop because I found this one in Manhattan. Like many another young cat, I'd worshipped at the altar of Leslie West and was keen to emulate the sound he wrested from his Junior. 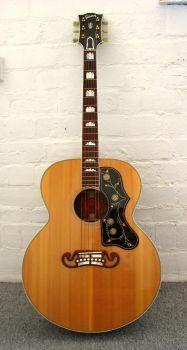 After trying maybe twenty guitars in New York, I found this 1956 model complete with original case. "Good choice Buddy" said the boy behind the desk. "Leslie West is in here playing that one all the time, it's his favourite." Well that was good enough for Betty Thyer's boy. Later that week I met Les Paul himself. He was with his son, also called Les Paul. Naturally, since I had just bought a Les Paul Junior I asked the younger man to sign it, but he didn't get the joke. A few years later The Worried Men got to play with Mountain and I showed my guitar to the band and the crew, but Leslie West himself was in a massive strop so I declined to rub his nose in my appropriating his chosen guitar. 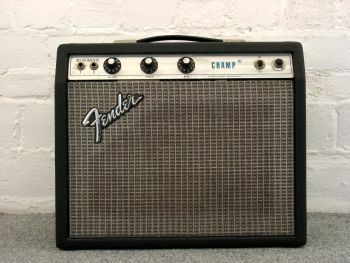 This Fender Champ was found on E-Bay for very little money. I use it for recording rhythm tracks. Roger gave me (gave me!) this Fender Pro Reverb amplifier. Just the ticket for recording clean sounds. Very handy for putting your feet on when playing too. 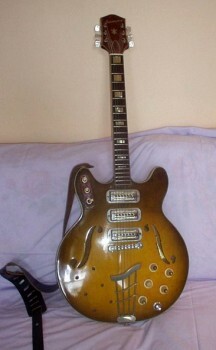 Remember my 1963 SG Special? Well, literally as I walked to the car with my new treasure, I was stopped by a street person trying to sell me his guitar, this Epiphone Sheraton. After checking its bona fides, I bought it for £150. 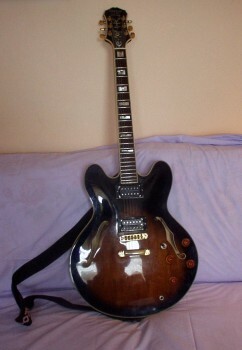 At the time a Gibson ES-335 retailed for £1100 and try as I might, I couldn't see £950 worth of difference. I changed the pick ups for Seymour Duncan units, set it up and later caught my finger in one of the F-holes necessitating a visit to Casualty, but that's another story. Probably my all time favourite album is the eponymous debut from Stack Waddy. For decades, I'd scrutinised the grainy photographs of the band, finally deciding that the guitar used was a Harmony H77. Should you want the early 1960s English beat/R & B sound, this is the way to go. 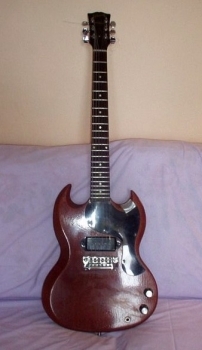 Another Gibson SG/Les Paul Junior? Yup, but this one's from 1962 and sounds as hairy as coconuts. 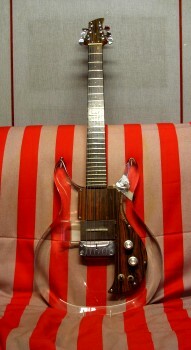 This may or may not be the only solid body guitar made by the Kinkade brothers, but it's certainly the first. It was completed to my specifications and I used it for years most visibly at the Glastonbury festival with Beverley Martyn. 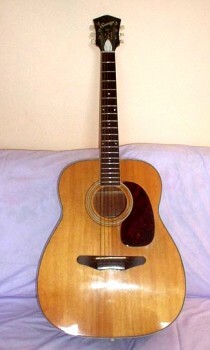 Battered Harmony Sovereign acoustic guitar from the early 1960s which fell off the back of a passing Steve Treble. (I think Jimmy Page used a Harmony for seminal Zep acoustic tracks). You can get them for pennies because they are not currently groovy. If you see one get it - you'll thank me. 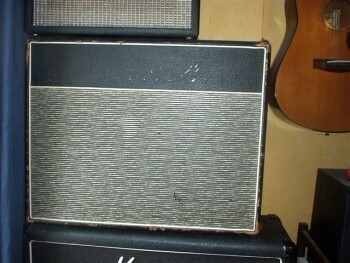 My eighteen watt Marshall 2 x 10 combo was made in the early sixties. They've recently started making them again, but this is an original. 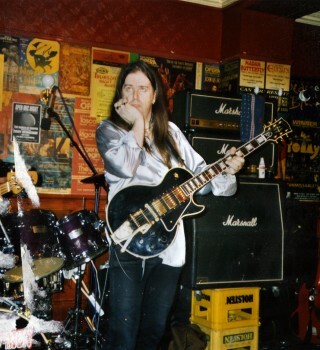 When I was at the Marshall factory they offered to buy it from me but I figured if they want it I should keep it. It sounds like a Vox AC30 who's just come home and found that somebody has left the top off the toothpaste again. 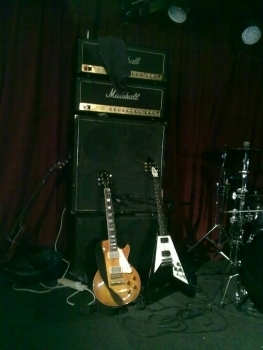 Here it's perched on top of a third JCM800 but a 50 watt model this time.